A History Vault profile is a list of recent searches, saved searches, and individual documents you want to save to view a later point. Log in to your profile by clicking on the link in the upper right corner of the page. Once you've logged in, you can go back to review and edit what is in your profile by clicking on the link in the same place (the upper right corner of the page). If you have a History Vault Profile you can save your search so you can access it easily later. To this, you’ll need to be logged into your profile. and then on the confirmation box, click OK.
To view any searches you’ve saved, click the View User Profile link at the top right of the page, and then click on Saved Searches. You can also save a record of your documents to your profile for easy retrieval later. Select one or more records from your results list. Then from the Save/Share button dropdown list, choose Save Results to Profile. To view any documents you’ve saved, click on User Profle >> View (your account name) link and then click Saved Documents. To create a profile, or to sign in after you have created a profile, simply click on the link in the upper right corner of any of the search pages. Creating an account/signing in requires an email account and password. An email account is requested so that your password can be forwarded to you in the event you need a reminder. Once you've created a profile, you can easily save searches or specific documents by using Save/Share button (on the right). Logging into your profile when you go into the product also allows it to tack your recent searches so you can review your searches at any time. 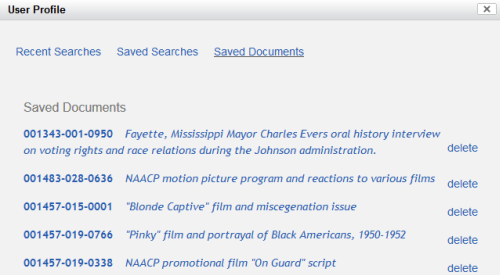 Viewing your profile, you can see Recent Searches, Saves Searches, and Saved Documents (shown here).